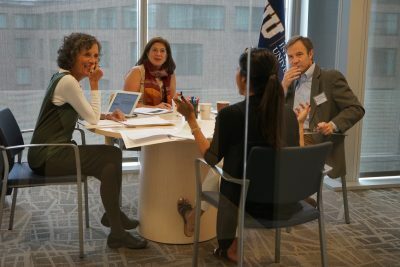 This past week in Washington D.C., FIU convened a select coalition of Ashoka Universities to explore opportunities for impacting social innovation policy at the federal level. Ashoka Universities is a consortium made up of 37 top-tier universities and colleges – including FIU, Arizona State University, Boston College, Brown, Duke, Johns Hopkins and the University of Maryland – that have embedded social innovation in their core. The consortium builds upon the mission of Ashoka, the world’s largest network of social entrepreneurs, to further a culture of social innovation in higher education. “If policies don’t change, social entrepreneurs can’t thrive,” said Sonal Shah, executive director of the Beeck Center at Georgetown University and founding director of the White House Office of Innovation and Civic Participation. During her time in the Obama Administration, Shah launched the Social Innovation Fund. In addition to Shah and Wells, also in attendance were FIU’s Chief Financial Officer Kenneth A. Jessell, FIU Ashoka Fellow Malik Benjamin and other representatives from the White House’s Office of Innovation and Civic Engagement. The consensus from the panelists was that higher education institutions need to collaborate with each other and Ashoka to continue to transform the field of higher education and impact policy. Ashoka U renewal team discuss how to drive social innovation forward. “It’s important to pay attention to trends, students who become social entrepreneurs begin in their teens. When young people are in charge more changes happen,” said Diana Wells, president of Ashoka. Those in attendance also shared their experience with social innovation through higher education and brainstormed ideas to drive social innovation forward. This brain-storming session included immediate ideas such as testing new social-innovation models as well as ways to build on the work of the current administration to continue to advance social innovation, regardless of the outcome in the presidential election. FIU combines the principles of “changemaking” into every academic discipline through its award-winning Global Learning for Global Citizenship curriculum. In Washington, D.C., the university is also advocating for research dollars and policy addressing urban challenges such as sea-level rise, transportation and urban affairs. 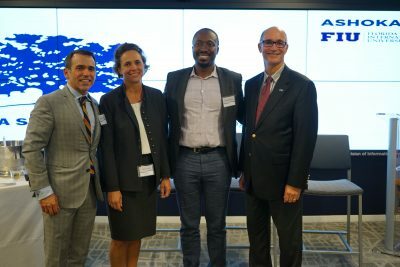 From left to right: Carlos A. Becerra, assistant vice president of FIU Federal Relations; Diana Wells, Ashoka president; Malik Benjamin, Changemaker faculty fellow; Kenneth Jessell, FIU CFO – gather after reception. Earlier that day, Ashoka was conducing its renewal process aimed at ensuring commitment by Changemaker Campuses to social innovation education. Arizona State University, Duke University, George Mason University and Rollins College were some of the universities that participated in the renewal process. FIU, in conjunction with Ashoka, prove there is an opportunity for universities like FIU to advance. 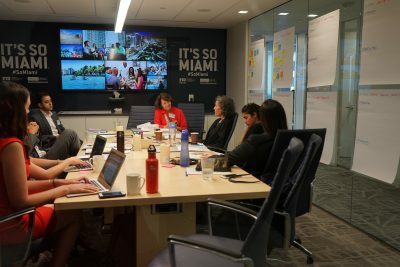 FIU has more than 200,000 alumni and, as such, can leverage its resources to drive innovation forward. The consortium will convene again at Ashoka U Exchange March 2-4, hosted by Miami Dade College. Click here to learn more about the Ashoka U. To learn more about FIU in D.C., visit washingtondc.fiu.edu; call (202) 558-3481; or follow on Twitter, Facebook and Instagram.